For Rubicon 1.1, Team Pirate Unicorns has been working on improvements to the tracking camera UI, and additionally the actual behaviour and movement of the camera when in tracking mode. Users of the tracking camera are likely aware that the UI is currently split up between two locations that are not necessarily related to one another. If you're not a user of the tracking camera, it may be that you are not aware of this relatively obscured feature. In general, we aim to improve the visibility of this feature and its controls so that players are able to easily switch in and out of the tracking mode according to their needs. Furthermore, the tracking camera controls and the indication to the user of which mode the tracking camera is in can be confusing and occasionally misleading. 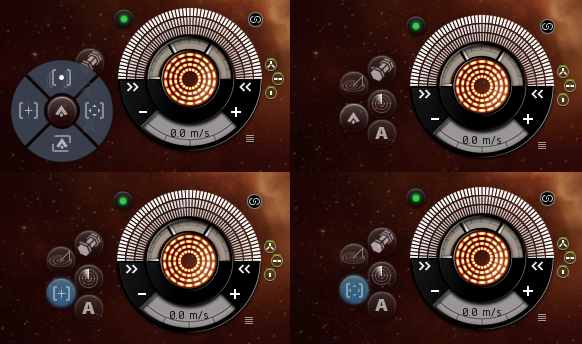 The composite image below shows the controls as they currently are, split between the Selected Item window and the Directional Scanner interface. You might notice the relatively small text indicator that the tracking camera is both on and in fact tracking. A problem we identified here is that when the tracking camera is on and ready to track the next selected item, there is no indication the camera is in that state. Our main goals in this improvement effort were to consolidate the tracking camera controls into a single UI location that is more readily discoverable, and to make it clear to the user which mode the tracking camera is in at any given time. While reviewing the tracking camera, we also saw some room for improvement of the behaviour and movement of the camera while tracking, together with the transition to and from tracking mode, and we're including as much work on that into the coming release as we can. In terms of the UI, we decided to make use of the radial button interface that was developed for the various scanning and probing functions. We saw an opportunity to use the existing 'Reset Camera' button and turn this into a general 'Camera Controls' radial that would include the tracking camera controls together with the reset camera function. One significant benefit of this approach is that the radial button itself can function as a clear indicator that the tracking camera is on and which mode it is operating in. The composite image below shows the various states of the radial button. If we go clockwise from the top left of the image we have the radial button: open with controls displayed; in the tracking camera off state; showing the tracking camera on and using custom position; and showing the tracking camera on and using centered position. 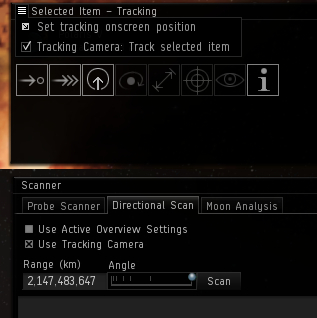 Using the controls the tracking camera can be toggled on and off, the custom position set and used, the center position used or the view returned to 'Look at my ship'. This last is the 'Reset Camera' functionality which we have renamed to avoid confusion and to also better reflect what it actually does. When considering these UI design changes, and also when looking at the behaviour of the camera itself, we had to bear in mind the important use case of combining the tracking camera with directional scanning. On the other hand, we also wanted to remove the confusion that was very often arising due to the 'dual controls' situation. We clearly saw that a way to reliably and quickly center the tracking camera position was needed to support directional scanning. We also wanted to support the uses players put the custom position to and so we provide clear controls for both – together with distinct icons to indicate the mode on the radial button itself. As a final couple of notes, the default keyboard shortcut to toggle tracking on and off will remain the 'c' key and, while its state will persist across sessions, the tracking camera will be off by default for new characters. The UI redesign has been implemented on the Singularity test server build and we would value your feedback. We have also made some changes to the behaviour and motion of the camera, particularly with regard to the issue of FPS and V-Sync having an effect on the speed of the tracking camera. With fixes to address the undesirable linkage with graphics settings and performance we felt able to increase the speed of the camera for all users.